It turns out lots of people named their kids after Baker Mayfield. 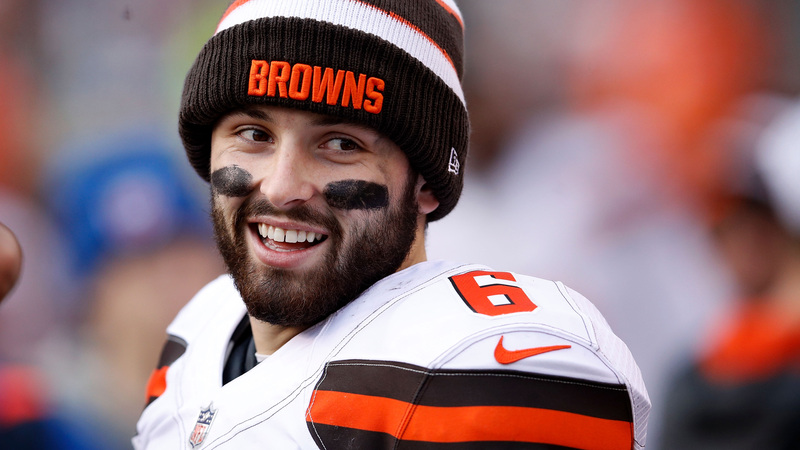 Baker Mayfield had maybe the best game of his short NFL career on Sunday, passing for four touchdowns in a Browns win over the Bengals. One of the first things he did after coming off the field was retweet a fan who said his wife had agreed to name their son after Mayfield if they got the precious retweet. A deal is a deal. It turns out lots of people named their kids after Baker Mayfield, including at least one born before his Heisman-winning season. I can certainly understand Sooners fans naming their kids after Mayfield. He had a great college career and his Oklahoma legacy is already etched in stone. But if I was a Browns fan I’d be so traumatized by decades of quarterback disappointments that I’d probably wait more than nine games before rushing to name my kid after the latest guy on Cleveland’s long list of QBs. I guess if things go south you could always pretend to be a big fan of former NBA center Vin Baker. That’s Cordarrelle Patterson getting a little too familiar with Jets defensive end Henry Anderson. Patterson was sneaky enough not to get called for a penalty, which means were robbed off the opportunity for a sequel to the best call in NFL history. Saturday’s LSU-Texas A&M game went to seven overtimes, and the insanity didn’t stop there. As the two sides mingled about on the field, LSU assistant Kevin Faulk was caught on camera throwing down with a man in an A&M polo. LSU offensive analyst Steve Kragthorpe, who has Parkinson’s disease, told The Daily Advertiser that the as-yet unidentifed man had punched him in the chest and caused his pacemaker to go temporarily haywire. The latest twist is that The Advocate has identified the the guy in the A&M shirt as Jimbo Fisher’s nephew. Will Texas Tech’s next coach stay true to its Air Raid roots? ... So much drama this weekend in Argentina after soccer fans attacked a rival team’s bus and the game was forced to be postponed. ... Who deserves college football’s final playoff spot: Oklahoma or Ohio State? The Kent State men’s basketball team has the first ever Division-I recruit diagnosed with autism. ... Jalen Ramsey got beaten by Josh Allen but he’s not ready to say Allen isn’t “trash”. ... No love lost between Baker Mayfield and Hue Jackson after the Browns beat the Bengals. Did you seriously try to dive into the end zone from the five-yard line? @joelembiid off the glass to himself! Ohio will let you pay your taxes in Bitcoin, for some reason. ... Scientists suggest a new solution to climate change: spraying chemicals 12 miles above Earth’s surface to dim the sun.